Hey guys thanks for the add. I have a 2013 X3 XDrive2.0 and its been going great until now. 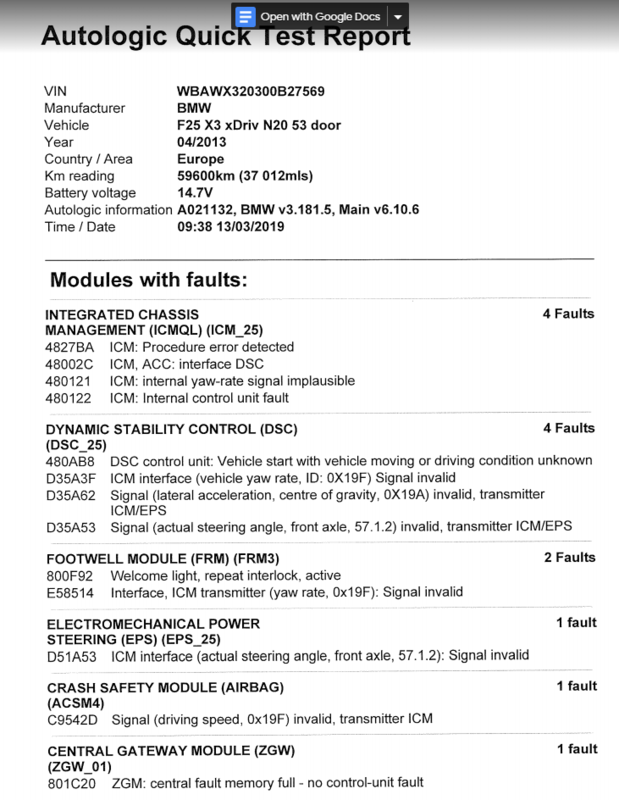 The DSC and TPSM lights came on and I took it to a BMW specialist and it gave the following codes. Thank you all lovely people for helping out!!! When the car turns on or ignitions on, no warning lights pop up. 3 seconds after the car starts rolling the DSC and TPSM warning lights appear. I have taken the battery into BMW for a full charge and cleared the codes to eliminate the cause of a lack of juice. SO the codes you see now actually point to something(s) thats actually wrong. Atm, car will only go into comfort mode. When parked at the lights (car stopped) I can toggle into Sport or Eco modes, but as soon as the car begins moving the system will default back to comfort mode. Generally car runs fine apart from the lights. Turns fine with no knocks/shudder/noise. BMW tech took it out on a road test and did not notice anything abnormal. It runs just like any other X3 I've tried but the lights suggest something is wrong.